Some people think that Taco Trucks migrate to the south for the winter. Not true. Just like the rest of us they hunker down, try to stay warm and try to make a living until spring comes along. 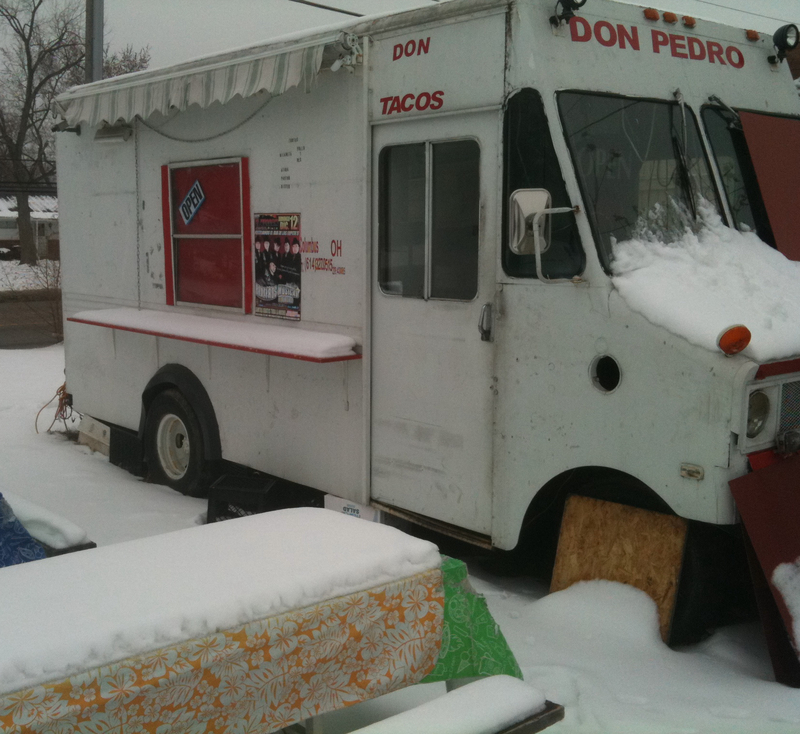 Most of the Taco Trucks in Columbus do stay open in the wintertime. However, their hours become a bit irregular and some just call it a day before the day begins. Equipment used in some of the trucks does not work well when it is below freezing and just like us – if the employees are freezing, they don’t work too well either. A few trucks take late December, January, February and early March off. Many reduce evening hours and try to stay open on days when the temperatures are above 32 degrees. In the case of Taqueria Jalisco II, the owners decided to open up at Mad River Mountain (skiing destination) and take the tacos to the people. Los Guachos and Super Torta II have brick and mortar locations to feed you when the outside temperatures bring fear to you. So, in the meantime, the best way to fight winter and avoid cabin fever is to go out there and eat tacos. This is also a way to ensure that taco truck you loved in the summer returns in the spring by making sure they have enough income to survive in the dark days of winter. A couple taco truck census missions were conducted after New Year’s Day. A few taco trucks have disappeared and a couple show no signs of recent activity. Two trucks seem to have repositioned to ride out the winter together as dueling taco trucks. Taqueria y Pupuseria Salvadorena and Taqueria La Morena have been open some weekend evenings in the parking lot of a bar which seems to change names every few months at 2400 E Dublin Granville Rd / SR 161. To support winter taco consumption, help out our friends during a slow business time and to help you fight the cold of winter with hot sauce we are listing some of the trucks you can depend on to be open for non snowmageddon days. Taqueria Brothers is also open during the winter–I was there a few weeks ago. Looking forward to receiving your new posts via email. Thanks. how did Mojo Taco not make this list? They don’t have a fixed location so we tend to include them with the street eats trucks.